Rosalia Lombardo was only two years old when she died from pneumonia in 1920. Her premature death left her father so heartbroken that he approached the noted embalmer, Alfredo Salafia, and asked him to preserve Rosalia’s body. 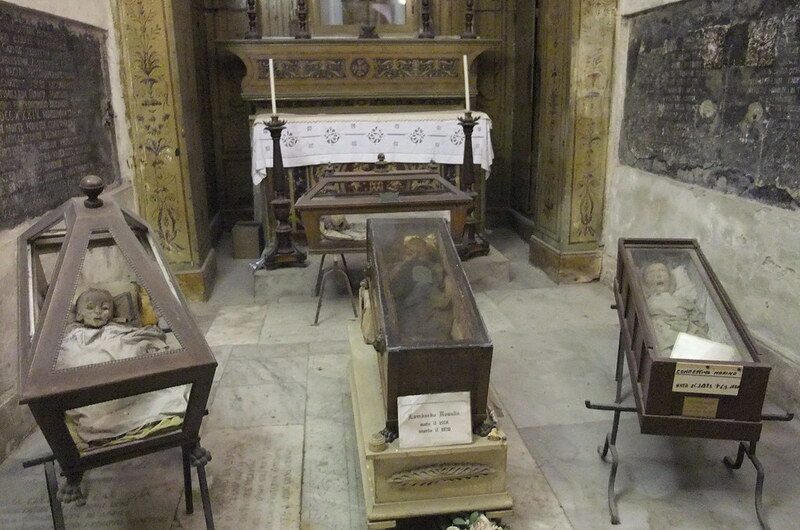 Alfredo Salafia, a skillful embalmer and taxidermist, performed such an excellent operation on Rosalia that nearly a hundred years after her death, the little girl appears to be merely dozing beneath the glass case in the Capuchin Catacombs of Palermo, Italy, where she rests. Her little cheeks are stiff puffy. Tuffs of blonde hair are gathered around a knot above her head and tied by a silk bow. Even her internal organs are intact, as revealed by X-ray scans. 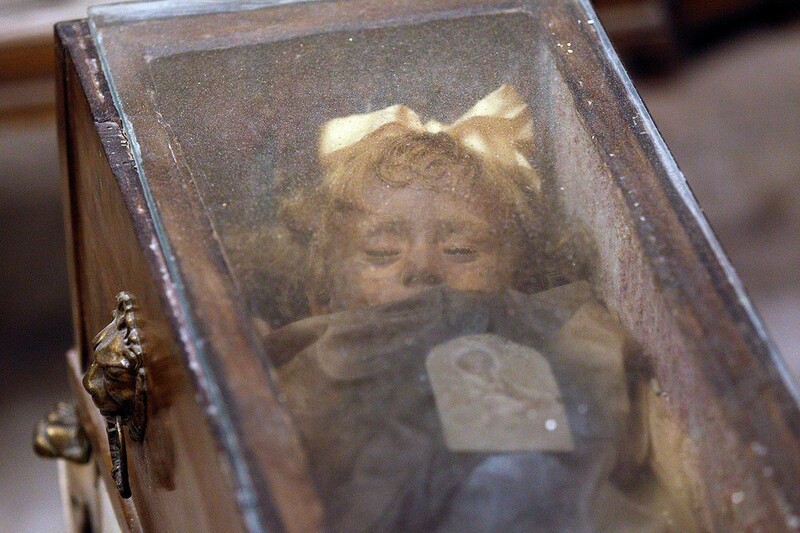 Nicknamed the “sleeping beauty”, Rosalia Lombardo has gained the reputation of being one of the world’s best preserved mummies. Rosalia’s perfectly preserved body is only part of the attraction. Visitors who come to see her swear that the little girl actually blinks here eyes. These sequence of pictures show her eyelids eerily opening and closing by a fraction of an inch. Her blue eyes are intact, like the rest of the body, and can be seen glistening in the low lights inside the catacombs. It’s thought that changes in temperature inside the crypt causes her eyelids to contract producing the blinking effect. But Capuchin Catacombs’s curator, Dario Piombino-Mascali, has a different theory. Piombino-Mascali believes that Rosalia’s blinking eyes is an optical illusion caused by the angle at which the light from the windows strike her. As the day progresses and the direction of the light changes, Rosalia appears to open and close her eyes several times throughout the day. Piombino-Mascali made this discovery in 2009 when he noticed that the workers at the museum had moved her coffin causing her body to shift slightly, which allowed him to see her eyelids better than ever before. Piombino-Mascali realized that Rosalia’s eyes are not completely closed and never were. But his real discovery was the secret formula Alfredo Salafia had used to keep Rosalia’s body in impeccable condition. In 2009, Piombino-Mascali tracked down the living relatives of Alfredo Salafia and found in their possession documents belonging to Salafia, where he had recorded his secret procedure. Unlike typical embalming, where the internal organs are removed and the empty cavities filled with natron salts to completely desiccate the body, Salafia made a small puncture in the body and injected a mixture of formalin, zinc salts, alcohol, salicylic acid, and glycerin. Each ingredient in the concoction performed a unique job. The formalin killed all the bacteria, the glycerin ensured that her body didn’t desiccate, and the salicylic acid wiped out any fungi in the flesh. The magic ingredient was the zinc salts that petrified Rosalia’s body giving it rigidity and prevented her cheeks and nasal cavities from caving in. The “sleeping beauty” is one of eight thousand mummies in the Capuchin Catacombs of Sicily. It was one of the last corpses to be admitted to the catacombs.